The sap of various acacia species dries to form a rubber-like resin called gum Arabic. It improves the viscosity of a preparation and provides quick drying and smudge-resistance when used in our Decorative Cosmetics. Cider vinegar is produced by fermenting organic apple juice. It is used traditionally as a hair conditioner and helps regulate the pH of the skin. Horse chestnut is a rich source of antioxidant plant compounds similar to those in pine bark (pycnogenol) and grape seed with firming and toning properties. Horse chestnut seed extract has similar properties to the bark extract (see above), but contains more esculin, a potent antioxidant compound that supports healthy water balance in skin. Lady’s Mantle has a beneficial firming effect on the skin and supports the skin’s healthy moisture balance. A food-grade ethyl alcohol (ethanol) from organically grown wheat that is fermented and distilled and gluten-free. Many plants are extracted in alcohol because it extracts the widest variety of plant constituents. Alcohol also serves as a natural emulsifier, preservative and carrier, helping ingredients penetrate the skin. Alcohol is not drying to the skin when part of a carefully formulated Dr. Hauschka composition. Algin is a gel-forming substance obtained from marine algae (seaweed). Helps thicken and stabilize creams and keeps the skin supple. Aloe is a succulent plant like kalanchoe and ice plant – a specialist in dealing with hot climates as its leaves have a high capacity for storing water. The juice from the leaf soothes the skin and helps support healthy moisture balance. Marsh mallow extract hydrates and supports the moisture balance within the skin. It is rich in mucilage, a humectant plant carbohydrate that is able to attract and hold water. Mucilaginous plants like marsh mallow are non-oily emollients with soothing and softening properties. Marsh mallow softens dry skin, promoting flexibility and resilience. Marsh mallow root extract hydrates and supports healthy moisture balance within the skin. It is rich in mucilage, a humectants plant carbohydrate that is able to attract and hold water. Mucilaginous plants like marsh mallow are non-oily emollients with soothing and softening properties. Marsh mallow softens dry skin promoting flexibility and resilience. Also known as Aluminum Oxide, aluminum is the third most common element in the earth's crust. 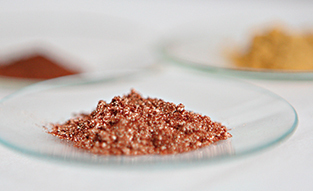 Alumina serves as an insoluble carrier for mineral pigments. Alumina is not absorbed through the skin and is approved for use in Natural and Organic personal care by both BDIH and NATRUE. A semi-precious yellowish-brown stone that revitalizes the skin. A rhythmitised preparation of amber is part of the formulation of Regenerating Intensive Treatment. Rhythmitized preparation of scarlet pimpernel soothes and calms skin. It serves as a model for proper moisture balance in the skin. Pineapple fruit extract is rich in vitamins and minerals. It is hydrating, giving the skin a pleasant, fresh feeling and smoothes fine lines and wrinkles. Also known as woundwort or kidney vetch, anthyllis is a member of the legume family and native to Southern Europe. It is little known today, but was traditionally used to cleanse and reduce swelling. Elisabeth Sigmund, creator of Dr. Hauschka Skin Care, studied anthyllis extensively. When used in skin care preparations, she observed a balancing effect of oily, dry and even irritated skin. Anthyllis has a generally stimulating and normalizing effect on the skin. 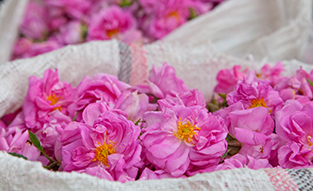 It is a key plant in Dr. Hauschka Skin Care, found in many face care preparations and Decorative Cosmetics. A pharmaceutical-grade organic peanut oil is used as an extracting medium for many plants. It has neutral qualities that do not interfere with the herbs. It is a very stable oil, requiring no additional antioxidants. Our peanut oil is steam treated and filtered to remove the proteins and has been tested and certified as aflatoxin-free. Burdock roots are a traditional ingredient in hair care products to support a healthy scalp and strong, healthy hair. The burdock root is valued for its generally detoxifying and fortifying properties. A nutrient-rich, nourishing and emollient oil from the thorny evergreen Moroccan ironwood tree cares for the skin and adds shine to lipsticks. The tree produces a fruit containing large seeds which are pressed to extract the precious oil. Ironwood trees grow only in Morocco and are protected by the Moroccan Arganeria Desert Preserve for their important role in preventing encroachment of the Sahara desert. Fair trade in this sustainable harvest helps the local economy while preserving the trees. A bluish-grey-to-black silver mineral with a metallic sheen. In combination with the other ingredients in Intensive Treatment for Menopausal Skin, Argentite supports the skin’s own processes of renewal. An extract made from the sunny yellow flower heads/blossoms of the Arnica montana plant, which belongs to the Daisy (Compositae) family. Arnica contains many compounds, including flavonoids, silicic acid, tannins, carotenoids and essential oils. 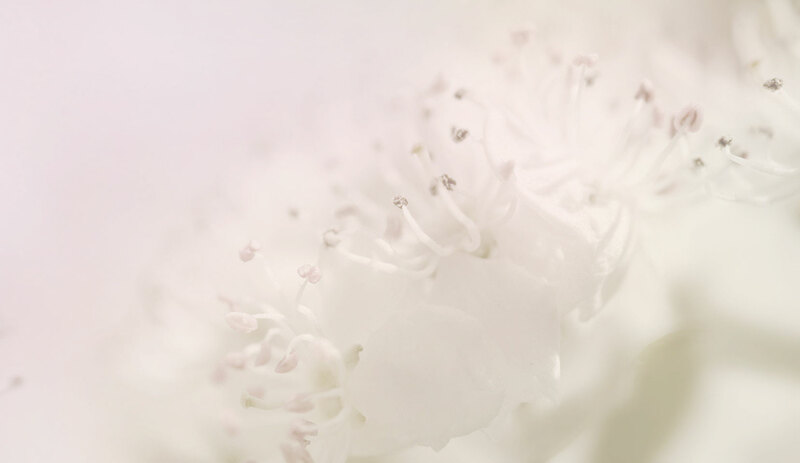 It supports the skin’s own processes of renewal and self cleansing and has a soothing action. Also used in hair tonics. Related to wormwood, southernwood helps reduce the appearance of visible capillaries. It supports vitality and moisture balance in the skin and helps fortify the skin’s barrier. Also known as Ester C, a form of Vitamin C. Serves as a natural antioxidant preservative which keeps products fresh and prevents color change.